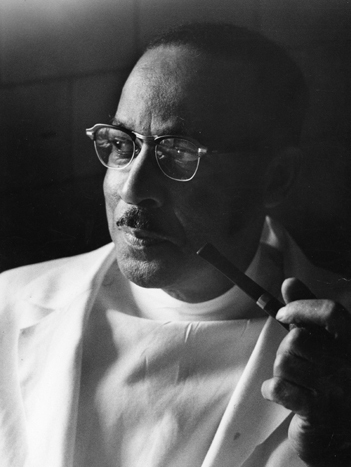 Vivien Thomas graduated with honors from Pearl High School, but was unable to complete his medical education after his savings were lost in the Great Depression. He joined Vanderbilt University’s medical school as a surgical assistant, working for Dr. Alfred Blalock. In 1941, Thomas moved with Blalock to The Johns Hopkins University. While working with Blalock on high-blood pressure, traumatic shock, and cardiac research, Thomas collaborated with Blalock and others in the invention of several surgical devices and techniques. One invention, a spring device, illustrated that shock was linked to a loss of fluid and blood volume. Thomas collaborated with Blalock and Dr. Helen Taussig to create a technique that delivered more oxygen to the blood and relieved constriction caused by a heart defect. The technique, anastomosis of the subclavian artery to the pulmonary artery, was used in many tetralogy of Fallot (blue-baby syndrome) operations with great success. Thomas also performed many pre- and post-operation procedures and advised during surgeries. Later, as supervisor of The Johns Hopkins Surgical Research Laboratories, he taught a generation of surgeons and laboratory technicians. After receiving an honorary doctorate, Thomas was appointed to the medical school faculty.